I can’t believe that Blog Week Day 6 is here, and so it’s almost over! Today’s topic: revisit a past FO. (For the uninitiated, “FO” means “finished object.”) Since I have precious few of those, choosing a special one was relatively easy. One of my earliest projects is, to this day, my most favorite. 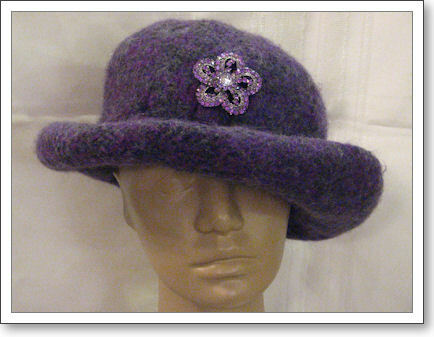 It is my first-ever felted hat. 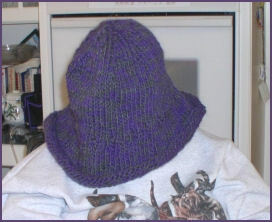 I made it in the early spring of 2004, but I actually bought the pattern, the Fiber Trends AC-1, in 1999, knowing that I wanted to make it one day. It was the first knitting project I ever got really excited about, and felt jazzed enough to stay up til 3 in the morning to finish the knitting. It is made with Brown Sheep Lamb’s Pride in one strand of purple and one strand of gray held together. Luckily, even though I was not yet blogging at the time, I did take a picture of the hat before felting (I was feeling the call of posterity). And this is what it looked like immediately after felting. I was amused that it looked so much like the silver mixing bowl that I used as a hat mold. I had to run it through a hot wash one or two more times after this photo was taken because it was so huge. 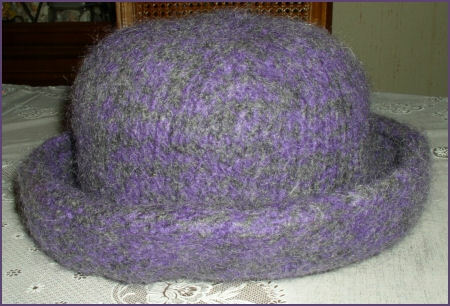 For Christmas that year in 2004, my co-worker gave me a large purple pin because, she said, it reminded her of my hat. She took the hat off my desk where I had it perched and put the pin on, on the spot. Because of this, each time I make these hats, and I have made several, I always adorn them with something. Usually it’s jewelry, but sometimes it’s a cabled hat band or something fun and funky. I’d love to make one with big, floppy flowers. To this day, everywhere I go, I constantly get stopped on the street (literally!) so people can ask me where I got my hat. I beam with pride when I can say, “I made it myself!” This is the only knitted thing I’ve ever made that has gotten this reaction. The hat has mellowed with age. The shape is no longer crisp like that of a newly finished project. I’ve been tempted at times to re-run it through the wash again and see if it will “freshen,” but then, I kind of like the mellowed, aged look that this hat now has. I have plenty of yarn to make other hats, and have several more colors planned for myself. But this hat is my darling, and I think I’ve been avoiding making a new one because this one is so special to me. So there you have it, my favorite FO. I’m off to the Maryland Sheep and Wool Festival this weekend, which is my favorite event of the year. Funny that tomorrow’s topic is about a favorite yarn. I’ll probably have lots of new stash to talk about! Hmm… I thought FO was “Found Object”. I have some interesting ones. That is a cute hat and a sweet story. Have fun at the wool festival! Love that hat! It looks really cosy and the brooch complements it beautifully! Felting and lace are magic in my opinion. Love that before picture.